Permanent teeth may submerge inside the jaw bone or gums for a few reasons. Ectopic tooth – tooth is not at its original eruption site, it has been displaced to somewhere else. This usually happens to permanent canine. 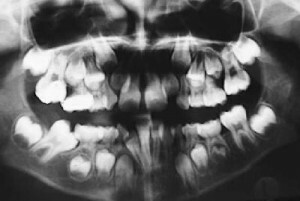 Radiograph (X rays) such as OPG (Orthopantomogram) or occlusal films would be able to pick up the whereabouts of un-erupted teeth and determine its cause of uneruption. A ‘misplaced’ un-erupted tooth is usually surgically removed to prevent cyst formation and infection. Ankylosed baby tooth would not grow with jaw so it would look submerged in time compared to its adjacent teeth. Sometimes it is advisable to extract or surgically removed it and restore it later with methods as mentioned above. 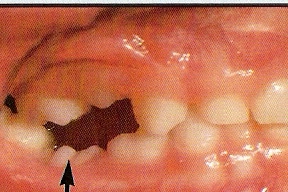 Keep track of normal tooth eruption in children. This is a problem with the alignment of teeth. Usually happens when space is insufficient for tooth eruption. 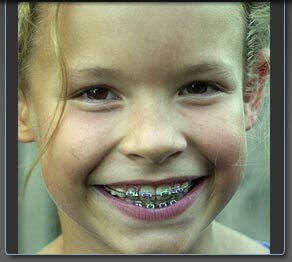 The only way to treat it is orthodontic treatment or braces. It is often treated as early as possible as children’s teeth move faster than adult. In some cases, extraction of some sound teeth is inevitable to make space for realignment. Your child could see a dentist or orthodontist who specializes in this field. It is characterized by certain yellowish and brownish strips or discoloration on all the surfaces of teeth which is not removable. Mother or the child ingests tetracycline (a type of antibiotic) while the teeth are forming either in the womb of mother or when the child was young. It is susceptible to decay therefore strict oral hygiene is important. To do crowns or veneers to mask the esthetically displeasing color of teeth when the child reaches 18 years of age. Frequent follow ups with the dentist to help maintain their vitality. Avoid taking tetracycline throughout pregnancy and while the child is growing from 1-8 years of age. It is seen as white spots, streaks or flecks on the surface of the teeth. Some severe cases may even have yellowish and brownish discoloration. This is common when a child is receiving high amount of fluoride through drinking fluoridated water or accidental ingestion of toothpaste. Drinking fluoridated water with recommended low levels of fluoride would not cause this. No treatment is required if the staining is not severe. Crowns or veneers are advisable if the discoloration is severe. 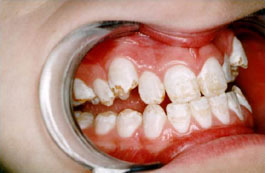 Fluorosis made the tooth surface both weaker and stronger in certain cases. For weaker cases stringent oral hygiene is essential to prevent tooth decay. If we manage to incorporate dental health into our children’s life, we help bring them a good smile and a better future. So start now and never regret later. If you wish to read the part I, click here. This entry was posted in Oral Care and tagged ankylosis, crooked teeth, dental fluorosis, ectopic tooth, OPG, orthodontic treatment, tetracycline stained teeth, unerupted tooth on November 22, 2009 by Dr Erica Tan.